Shortly after she turns 15, Schuyler catches the eye of Jack Force -- the hottest and most popular boy at school. Then Schuyler learns that she is a member of an ancient, elite vampire group that has been around since early settlers landed at Plymouth Rock. Better yet, it's possible she might even be tied to the notorious disappearance of settlers at Roanoke (Croatoan!). As Schuyler and her vampire classmates come into their own as new vampires, or "Blue Bloods," she realizes that she has memories of various moments from her past lives -- some of which feature Jack Force. Schuyler also embarks on figuring out who is slaughtering other vampires at school, and why. I've always been a major fan of vampire novels since I was a little girl, and must have read the unabridged version of Bram Stoker's Dracula about 10 times. After Bram Stoker, I got stuck on L.J. Smith's Vampire Diaries series (the original series from the early 1990s), followed by Anne Rice's Vampire Chronicles. I feel that I'm pretty well versed in vampire lore, which is why it gets tiresome when traditional vampire "rules" are changed. Yes, vampires are fictional, and authors have the complete creative freedom to write vampires however they want. I get that. But sometimes it just gets old keeping up with all the new vampire rules from book to book. Every vampire novel is accompanied by the author's explanation of their own rules, which gets annoying after awhile. I have difficulty keeping track of vampire rules per series and author. Does this make sense to anyone? Is the premise behind Blue Bloods intriguing? A little, especially since in this series, all the vampire souls are recycled through different bodies and have the ability to retain memories over the centuries. Is the premise intriguing enough to keep me drawn in? Probably not. But I do commend de la Cruz on having developed what seems to be one of the hottest new vampire series for teens and young adults. 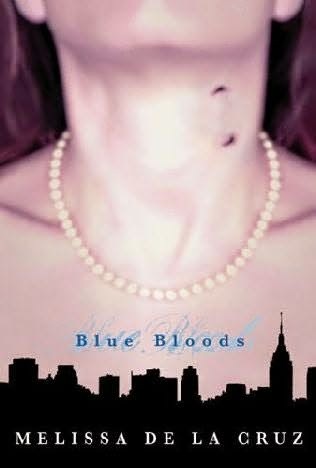 The novels that follow Blue Bloods in this series are Masquerade, Revelations, The Van Alen Legacy, and Misguided Angel.